Is there no balm in Gilead, is there no physician there? Why then is there no recovery for the health of the daughter of my people? (Jeremiah 8:22 NKJV). Gilead is a small territory in Israel that was well known for healing of ailments including strange ailments that defer medications through the use of natural herbs with divine medication. Sick people were referred to Gilead from all over the world (Europe, Africa, Asia, etc.,) for treatment with the hope of getting their healing. No matter the strange ailments, whenever a sick person steps into Gilead, there is hope for him. The balms or syrups that were used for medication to the sick were divinely revealed to the prophets and the sons of the prophets by God. In the Bible: herbs, fruits, and vegetables were God’s recommendation for the nations’ healing (Revelation 22:2). Of course, God and His Word of Life can never lie. Even though Satan and his agents may try to counteract and adulterate what God had said in His Word of life, God’s Word is still yea and Amen. It can never change no matter the condition of life. The Rhema Balm of Gilead Herbal Juice/Wine came through divine revelation of God to His servant, Rev. (Dr.) Evang. Timothy Osemudiamen Okhomhen, the President and Writer of The Rhema Interdenominational Ministry. God told him, “I want to shame Satan and his cohorts through your life and reveal My power through your ministry.” He further told him that right from immemorial He had been in the business of using the foolish things of this world to shame the wise; therefore, I have decided to use this Food Supplement to shame the devil and his cohorts. In fact for more than three weeks, God took me on a spiritual journey through revelations and dreams by showing and teaching me things that were beyond the physical. He showed and taught me the things to use, the formula to apply and the chemistry process. I have never seen a mustard seed in my life since I was born, but He taught me the essence of it in The Rhema Balm of Gilead Herbal Juice/Wine and asked me to look for it. It took me almost two weeks to get it because of its importance in the Food Supplement. The Rhema Balm of Gilead Herbal Juice/Wine is purely divine and a spiritual life ointment. God told me that it will even take care of strange ailments that you never thought of and that have been the testimony of many. He warned me vehemently never to reveal the formula and the chemistry process to anyone except the one He chooses to succeed me in The Rhema Interdenominational Ministry. He further told me that both believers and unbelievers want proofs, results and evidence. This of course they will get through this ministry so that they will believe that He called me into The Rhema Interdenominational Ministry. Indeed, it baffles one’s understanding and makes people to wonder especially those in the field of medicine, “How can a single Food Supplement take care of all these ailments?” God’s ways are always mysterious and He can never operate the way man operates. That is why the Bible says, “But Jesus looked at them and said to them, ‘With men this is impossible, but with God all things are possible” (Matthew 19:26 NKJV). It may amaze you to know that The Rhema Balm of Gilead Herbal Juice/Wine does far more than what is being listed in the label. It is 100% Food Supplement with no side effect of any kind. It is also purely natural with no chemical of any kind. It is purely good for both adults and children. Its content is as follows: garlic, ginger, lemon, lime, moringa, papaya leaf (Pawpaw), aloe-vera, mustard seed, and pure/undiluted honey. Naturally, the function of each of these components does more than five functions in the body. Each of these components has larger percentage measurement in the composition of the Rhema Balm of Gilead Herbal Juice/Wine. The heart is the engine room of the body just as the engine is to the car. When the engine is faulty and knocks, the car is dead no matter how big and beautiful it looks. In the same way, when the heart is faulty and knocks, the body is dead no matter how big and beautiful it looks. This miracle Food Supplement works with the heart and pumps blood round the whole body system thereby keeping one strong, vibrant, healthy, and fit daily. If you are a doubting Thomas; therefore, get a bottle of The Rhema Balm of Gilead Herbal Juice/Wine and follow the prescription and see how you will look like within five days, then go for BP, sugar and general body tests after seven days of medication. It will miraculously amaze you of your tests’ results. If you are still doubting and thinking that this is a scam, it therefore means that you still doubt the power of God or you are just in a state of cynicism. DETOXIFIER/GENERAL BODY CLEANSER: One of the most effective ways this Food Supplement works miraculously is the ability to cleanse the entire system of the human body of its toxic waste. It flushes them out of the system through mild purging. There are so many toxic wastes and fats in the human body that are creating problems to the heart to successfully pump and circulate blood round the entire body. When they are not flushed out of the system and completely eliminated out of the body, it makes the heart to over work itself by causing Blood Pressure (BP) and diabetes to its victims. It further detoxifies the body system by removing poisonous substances out of the body thereby keeping the body healthy always. It also cleanses the eyes and correct eye-defects. ANTI-AGEING: Most times when the human body is seriously sick, some vital cells and organs fail to function and as a result the body aged faster than normal. The Rhema Balm of Gilead Herbal Juice/Wine has the potency to vitalize these dead cells and organs to function effectively by bringing out the body’s radiance and beauty. You will miraculously notice that your skin becomes glittering and gradually eliminates premature gray hair. It gives the human body the nutrients which it needs to function effectively and look good. REVITALIZING THE DEAD BODY CELLS AND ORGANS: Blood Pressure (BP) and Diabetes are termed silent killers because they gradually kill one’s body cells and organs. Sometimes if care is not taken, they damage completely the heart and kidney. That is why people just slump and die while others undergo painful and costly dialysis just to survive. But with the help of the The Rhema Balm of Gilead Herbal Juice/Wine couple with the grace of God, the dead body cells and organs can miraculously pick up to function effectively. FAT REDUCTION/EXCESS WEIGHT LOSS & BELLY FAT BURNER: The Rhema Balm of Gilead Herbal Juice/Wine has the potency to burn fat in the human body especially the stomach fats thereby causing excess weight loss. One will suddenly notice that he is becoming lighter in weight and his stomach becoming flat as he uses it daily. EXCESS SUGAR REDUCTION/DIABETES: It flushes excess sugar out of the entire system by completely eliminating diabetes within few days. One will miraculously find himself stronger, healthy and even more active daily. Excess sugar is the big enemy that ravages the human body and makes it impotent. STABILIZING BLOOD PRESSURE (BP): It has the potency to stabilize one’s Blood Pressure (BP) within few days by making the heart to function normal. It can never bring your BP below normal. That is the miracle behind this Food Supplement. ARTHRITICS/RHEUMATISM/CRAMPS: It gives great succor to patients with arthritics, rheumatism and cramps within few days. No matter the pains one faces as a result of arthritics, rheumatism and cramps; they suddenly die off and the patients get great relief and succor. GENERAL FEVER/MALARIA AND TYPHOID: It is a great remedy to general fever, malaria and typhoid no matter the severity. Taking some doses according to the prescription give one great relief. A GOOD REMEDY TO BOTH SEXUAL/TOILET INFECTIONS: Infections if not properly treated destroy one’s reproductive system in the human body. It also affects the body mechanism by making it to malfunction. The Rhema Balm of Gilead Herbal Juice/Wine has the potency to flush out all kinds of infection from the body especially sexual infections. PILE/FIBROID: The Rhema Balm of Gilead Herbal Juice/Wine is a very good remedy to both pile and fibroid no matter the severity. BOOSTS IMMUNE SYSTEM: When one’s immune system is boost up, one hardly falls sick. The body mechanisms will have the ability to withstand diseases and infections that are supposed to affect the body system. 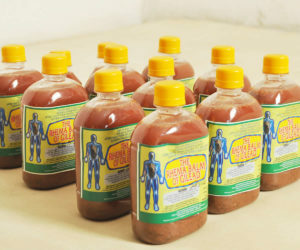 The Rhema Balm of Gilead Herbal Juice/Wine has the potency to boost one’s immune system in the body thereby keeping him healthy, strong and vibrant daily. BOOSTS STRENGTH WITH FULL ENERGY: This Food Supplement is a great energy booster. It renews one strength and vigor daily. One can only find himself sweating in the body without getting tired in anything he does. This causes one to always find himself taking a lot of water in order to replenish dehydration as a result of sweating. It keeps one alert full of vigor and vitality. BOOSTS LIBIDO/WATERY SPERM: Libido is commonly referred to as, “Manpower.” It is sexual stamina and ability to satisfy a woman sexually even beyond first round. So many men are no longer active sexually to satisfy their wives due to excess sugar and BP in their body system. As a result of this, they can no longer gain fixed and rigid erection that can last and satisfy their wives. The Rhema Balm of Gilead Herbal Juice/Wine is a great remedy because it helps to boost libido or “Manpower” in order to perform excellently in the bed. Furthermore, it helps to boost up one’s watery sperm to be able to fertilize the female’s eggs in the ovary thereby making her pregnant. BOOSTS APPETITE: This Food Supplement boosts one’s appetite and digests food easily. One eats food without constipation of any kind. You will often hear the rhythm of your stomach day and night and empty your bowels completely without stress. ENHANCES THE GENERAL WELL-BEING: It enhances the general well-being of an individual by keeping him strong, active and healthy always. One will always be full of life, sleep and relax well. IMPROVING MEMORY ALERTNESS: This Food Supplement helps to improve the memory alertness of an individual. It keeps the brain to function optimally through positive thinking and with the ability to remember easily devoid of memory loss. Take note of the fact that the heart is the engine room of the human body, while the blood is the engine oil to lubricate the entire body system. The Rhema Balm of Gilead Herbal Juice/Wine works with the heart and the blood to lubricate the entire human body and system. That is the reason why it does all listed above and even beyond. It is purely a spiritual life ointment. “…With God all things are possible!” (Matthew 19:26 NKJV). If interested, call: Rev. (Dr.) Evang. Timothy Osemudiamen Okhomhen– +234-8051430395; +234-8035196707 to put an end to that ugly situation you are currently undergoing and enjoy full health with vitality. Bronze FM @ Aduwawa Road, Benin City- Mr. Sule: 08069137788. Edo State Broadcasting Service (EBS) Canteen, Aduwawa Road, Benin City: 07084849262. Palm House @ Environmental, Sapele Road, Benin City- Mrs. Ikponmwosa: 08028921105. Edo State Secretariat Complex, Sapele Road, Benin City- Mr. Chuks: 08063200153. Edo State Magistrate Court @ Cash Office, Sapele Road, Benin City- Mrs. Edomwande: 07057188702. Ministry of Education @ Central Administration, Benin City- Mrs. Ehijiator: 07035058189. Ministry of Education @ Account Dept., Benin City- Madam Lolo: 08032734190. University of Benin (UNIBEN) Pack and Garden- Mr. Michael Onorokpara: 07043678410. University of Benin @ Pharmacy Department- Mrs. Celestina Onwumere: 07038228133. University of Benin @ Post Graduate School- Mrs. Iyasele: 08073043223. i. A 600m /s bottle is N2, 000 only. ii. A 200m/s bottle is N700 only. This product had been tested and verified, good for both adults and children. Please, take note of the fact that you will bear the cost of delivery, way bill or transportation if need be. This is not scam but more than a 100% real. Just take a trier and see for yourself. We deliver promptly without failure. Marketers and distributors are needed for wholesale purchase. For further details; Website: www.therhemadevotionals.org. Facebook: www.facebook.com/therhemadevotionals. Kindly lay your requests/complaints to: therhemadevotionals@gmail.com. Shalom!